Our intrepid reporter, Ali Watson, interviews our new frosh 200 meter record holder Chris MacIntosh who talks about his record, hurdling and the transition from high school to college. Click here to hear it and here or on the picture to see Chris' record run. Anderson who has NCAA provisional qualifications in both the mile and the 3K talks about her school record 4:43 mile and her upcoming race schedule. Click here or on the picture. In the top video, Allie Lewis runs a school record 1:33.8 followed by Ashley Madonick in 1:34.98 and Dana Harvey who are now 1- 2 and 3 in the WM record book. Video number two is Katie Guevel's 200 meter school record of 25.38 and the third is the first leg and one half from the school record 4x400 of Harvey, Lewis, Anderson and Madonick. If you want to see Anderson's school recod mile (lap one) click here, Evans in the high jump, Gaeto's long jumps, Guevel's 60 m frosh record of 7.89 go here, Klatzkin's shot put, for MacIntosh's frosh record click here in the 200m and for Morse's shot put, click here. In her mile debut, Anderson shaved three seconds off of the school record by running a 4:43 mile which meets the NCAA provisional time and is 17th in the US. The 4x400m relay team of Dana Harvey , Allie Lewis , Emily Anderson, and Ashley Madonick ran 3:51.12 for seventh place, crushing the school indoor record by three seconds and beating the ECAC-qualifying standard. More Ian Fitzgerald took second in the 3,000m run with the team’s season-best time of 8:19.48 qualifying for the IC4A Championships while Charlie Swartz was fourth in 8:31.73. Brandon Evans was fourth in the high jump 6’ 6.75” and Patterson Wilhelm was eighth in the mile with a time of 4:13.58. More Check back Sunday evening for video and pictures. Chris McIntosh ran 23.17 in the 200m dash breaking the freshman record of 23.50 set in 2003. 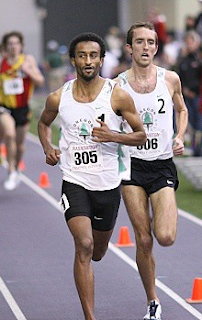 Ben Massam qualified for the IC4A Championships in the 5,000m, timing 14:42.44 for fifth place while Brandon Oliver (seen above) became only the 10th Tribe athlete to break the 50-foot barrier in the weight thrown with his 51' 0.25" effort. More Allie Lewis won the 600m dash in a school-record time of 1:33.28 just ahead of Ashley Madonick and Dana Harvey. Katie Guevel ran frosh records in the 60 m dash with 7.89 and 25.38 in the 200 meters. Emily Gousen while Lynn Morelli finished second in 17:23.77. Alyssa Gaeto ranks eighth in school history after 8.10 in the 60m dash. More You can click here and get live results all day Saturday. Above is the 60 hurdles final where Katie Guevel set a frosh/school record. You can also see Gawne (weight), MacIntosh (200), Oliver (weight) or all of them (including other Guevel ones). Also check back tomorrow for an interview with Ed Moran. Chick-Fil-A Carolina Invitational - PR's Galore! W&M Coaches had a great day at the XC Trials. 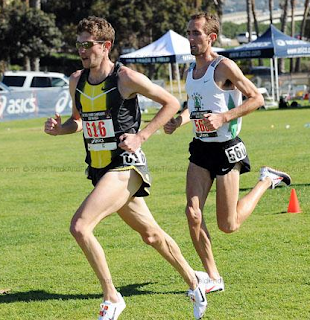 Ed Moran finished fourth in 35:42 for the 12,000 meter course (see him finishing in the bottom video above)earning a spot on the USA team that will compete in Edinburgh, Scotland at the end of March. Kathy Newberry finished 7th by running 27.07 for 8000 meters and finishing in the first alternate position, but with two others ahead of her not going, she will be a member of the USA team. Watch her post race interview above. 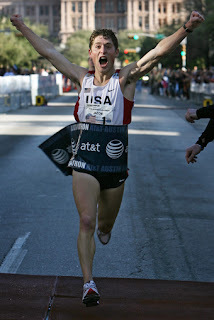 Moran's ex-teammate, Sean Graham finished 17th. Also click here for another recent interview with him. From the top, Katie Guevel's 3rd 55H school record, Emily Anderson interview after her provisional 3000 meter NCAA qualifier, Nicole Gaeto interview and her school record long jump. There is more. 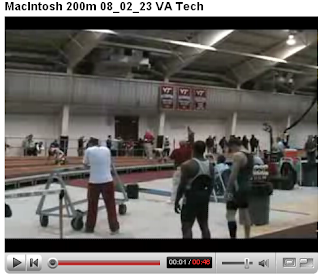 Click on each name to see more video: Brower 55m, Cochran 55m, Fagbami 55m, and Gaeto's school record long jump or click here to see all videos. Emily Anderson ran 9:27.88 in the 3,000m to win the event and break the NCAA provisional-qualifying barrier. In the long jump, sophomore Alyssa Gaeto won in a school record of 19’ 0.75”. while Katie Guevel took third in the finals with a school-record time of 8.17. Lynn Morelli, running a PR of 9:47.82 and Nicole Kazuba who won the pole vault with a height of 12’ 1.5" both qualified for the ECAC meet. Much more. Check Sunday evening for video and pictures. 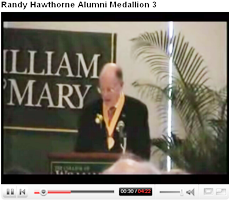 Click on each photo above to hear Randy being given his alumni award. 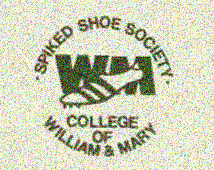 Also click here to read about Randy's award and here and here to hear his two part interview with spikedshoesociety.org. Jeri Daniels '81 still is the second best outdoor shot putter in school history. 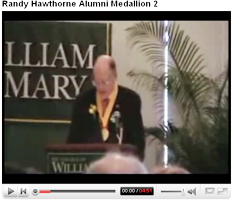 Even more amazing is that she was a member of W&M's first female team which was coached entirely by the distance coach. Consequently she also became the first female to work out with the men's team - something that is commonly done today. Read more. 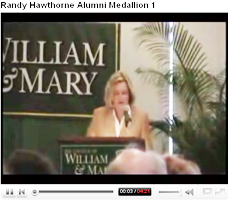 UNC Video: Click here to see it all or individually below. Click here for the men's DMR. Leg 1, 2, 3, 4. 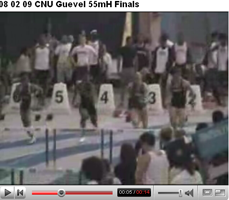 Here is leg 1 of the women's DMR and the other three. Here is Blitzer, Brower, Fagbami, Juice, Klatzkin, Oliver, Shriver (and more here). The women's distance medley relay team won their event in an ECAC-qualifying time of 11:48.36 while the men's DMR took the first step towards defending their IC4A crown by qualifying for the championships with a time of 10:15.14 for 3rd place. Men's weight thrower Brandon Oliver won the men's weight throw with a personal-best effort of 49' 0.75" moving him to 10th on the all-time list in the 35-pound weight. Ben Massam and Patterson Wilhelm went 1 -2 in the 3000 meters with 8:26 and 8:29 and each qualified for the IC4A meet. Second place finishes went to David Groff in the mile (4:15.16) and Ryan Jones in 1:56 in the 800 meters. Nicole Kazuba also finished second in the pole vault in 12-01.50 while Katie Guevel broke her school record in the 60 hurdles with an 8.84. Complete results from Friday and Saturday. Look here soon for video and pictures.